Please do not disturb the swarm, try to get them to move on or kill them. Once they cluster, they won't move until they're ready to, or a beekeeper removes the entire cluster. Check that they are in fact bees. Note where they are, how large the swarm is (relative to a common object like a basketball, rugby ball, elephant etc). Are you sure they're Honeybees? Please check that what you are looking at are in fact honeybees. Bees are orange/tan and black, fuzzy, and have indistinct stripes. Wasps are bright yellow, and have distinct stripes, their legs also hang down when flying, unlike bees. Honeybees are the only ones that will form a cluster out in the open. If they aren't clustered, they may just be feeding. 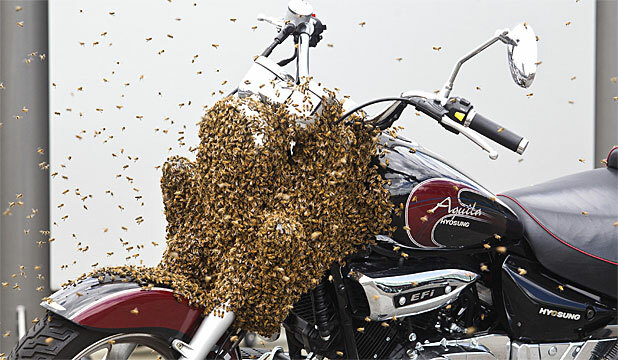 Swarm season is typically from September through to February. Early autumn sightings are usually bees of wasps feeding en masse on late flowering plants like ivy. Members of the Manawatu Bee Club are available to come and collect swarms at no cost to you. The bees will be put into hives where they will be cared for. If you have a colony that has set up camp somewhere you don't want it, it may be possible to remove it, though there may be a cost involved if it's time consuming. If it turns out to be wasps, some members will deal to it for you, but usually charge a fee to do so. Shannon area: Peter Rogers - 06 362 7239, if no answer please leave a message. Honeybees natural survival instinct sometimes causes them to swarm - most commonly because their current colony is overcrowded, by splitting into multiple colonies they increase their chances of survival. 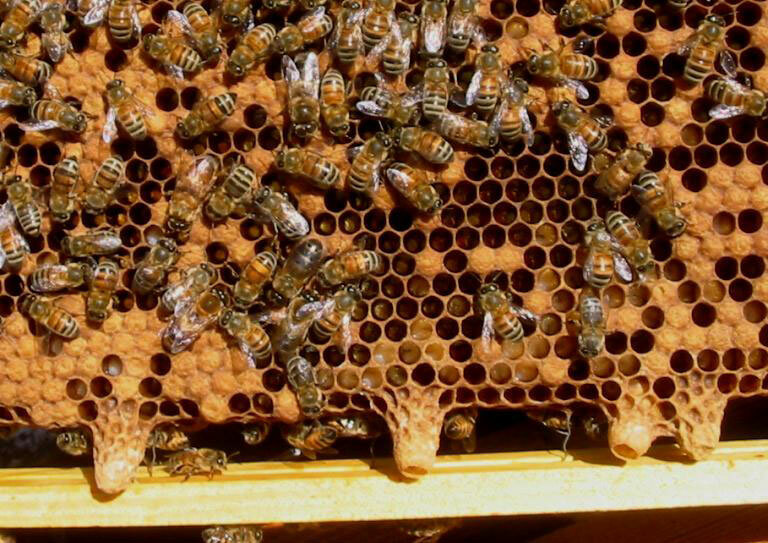 When bees swarm, approximately half of the colony will leave the hive with the queen and fly into the air. This stage can be quite disconcerting as they are flying about as a large cloud of bees, and it can sound angry and aggressive simply due to the buzzing of thousands of bees. This is not the case, they won't attack you if you're nearby. Shortly after leaving the hive they will settle somewhere while they wait for scouts to find a suitable location for the new colony to set up. While they are waiting, they are clustered together somewhere such as a tree branch, fence post etc. This is the stage at which a beekeeper can come and collect them fairly easily. They will stay in the cluster usually somewhere between a few hours and a few days though it can be as little as 10 minutes. While clustered they are not defensive as before they left the hive they filled up on honey making them more docile; also they have no hive to protect. There will only be a handful of bees airbirne around the cluster. The cluster may be small, only a few handfuls, or large, the diameter of a rugby ball and two or three times as long. Once the scout bees have found a suitable location the cluster will leave, become airborne and fly to their new home. Once they have moved into a new location they can be quite difficult to remove and may have to be exterminated. Colonies can set up in virtually anything that has the right characteristics - a reasonable size, weather tight, defendable entrances etc - this might be a wall or roof cavity, coal box, chimney cavity, vehicle engine bay etc. The Manawatu Beekeepers Club is focused on coordinating and promoting a variety of educational and social programs and services. These programs and services provide both beekeepers and the general public with opportunities to gain knowledge about beekeeping and honey bees.